Lithium-ion batteries power most of the devices we use every day, and their reach is only expanding. From the phones we carry to the cars we drive and the computers we surf the internet on, lithium is touching every aspect of our lives both at home and at work. Innovation is sprinting forward driven by a few key companies with the best in lithium technology and most public support in the energy market. The push for clean power is a major factor in the growth of lithium-ion batteries: wind and solar power are especially big in the public eye. Wind farms are being funded all over the world, and solar panels are appearing on homes, cars, and even airplanes. Lithium batteries are the main contender for storing all kinds of renewable energy. But even conventional energy sources are moving towards the lithium light. Utilities like Duke Energy, which still produces its electricity from fossil fuels, nuclear plants, and hydro-power, are switching from lead-acid battery storage to lithium-ion batteries. Changes like this at a utility scale can help electric grids run more smoothly. And on a residential scale, batteries like the Powerwall from Tesla (NASDAQ: TSLA) can help homeowners cut energy costs when the grid is in high use. Clearly, lithium batteries are a major part of our energy sector today. And the reality of the situation is lithium-ion batteries have yet to reach their full potential. They’re already starting to surprise with untapped potential, and they’re certainly going to remain prevalent in energy storage for a long time to come. The blue one up top is Tesla, which gained a ridiculous 1193.52%. And the green below it is SolarCity (NASDAQ: SCTY) which partners often with Tesla in lithium battery marketing. The two of them skew the results quite a bit. We can now better see how these companies have fared in recent years. 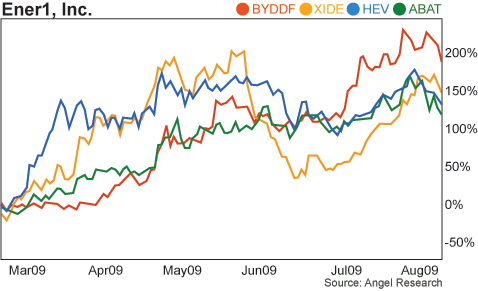 These three together have gained just under 34% in half a decade; and this is only the beginning for the lithium battery market. So what's supporting all this growth? 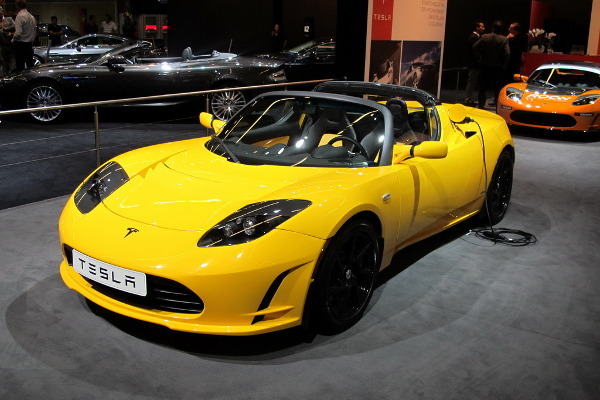 Tesla has quickly risen to fame as one of the only automobile companies in recent history to solidify its position in the industry, and as an electric vehicle company no less. And recently, its forward-thinking CEO and co-founder Elon Musk has gone beyond vehicles with the Powerwall battery, which is meant to be a back-up energy system for homes. These Powerwall systems and business-sized Powerpack systems already have more than 38,000 pre-orders, even though the Nevada-based Gigafactory that will produce them isn't expected to be up and running until 2016. For its car business, Tesla's first vehicle, the Model S, boasts a range of 270 miles on a single all-electric charge. Comparable vehicles like the Nissan Leaf can only reach 84 miles on an electric charge, or in the case of the Chevrolet Volt, 38 miles before it switches to its conventional fuel power. Both of these companies are planning new vehicle upgrades to compete with Tesla's designs, but they're not ready yet. Meanwhile, Tesla is focusing on cutting the cost of both its home and car batteries. The company recently took on a contract with Jeff Dahn, lithium-ion battery expert and professor of physics at Dalhousie University. And since this partnership began, Tesla's battery designs have already become revolutionary. In July, 2015, the company became the first to use silicon in electric vehicle battery anodes. This has never been done before, despite silicon battery anodes being able to carry almost 4x the lithium and up to 10% more energy than the current graphite anodes. The problem is that the addition of lithium expands the anode and could shatter it; but Musk and Dahn seem determined to make it work. But one company does not a market make. There are several other outstanding companies driving the lithium-ion battery revolution. SolarCity's stock has gained over 357% since 2010, with the largest gain of 2015 reaching more than 22% in May. This jump began the day of its first quarter earnings report, in which it announced a 5% increase in revenue from the same period in 2014 and the company's plans to offer Tesla battery installments to customers. SolarCity is Tesla's sister company being run by Elon Musk's cousin, Lyndon Rive. Short of familial relations, the two companies have been working together to promote each other's technology. SolarCity is not a pure lithium play; it is actually a solar panel company. But since the technology's announcement, SolarCity has been offering Tesla's Powerwall batteries as part of a package deal with its solar panel kits. As of July 2015, the two companies are also working together to supply houses in the process of being built with these solar energy production and storage systems. The company has also offered fixed rates for California residents for as long as 20 years. Its MyPower financing option, which it recently extended to Nevada residents, allows new customers to pay for the solar panels over time based on the amount of electricity they produce. This service recently extended across the country to Rhode Island as well. The expansion of SolarCity's panel systems means the expansion of Tesla's Powerwall batteries, which will be essential for homeowners wanting to use significantly less grid electricity. And as lithium battery costs drop, the customer base for both technologies will grow. Here's another name you may know: Panasonic's stock dropped a modest 4.49% on the OTC market since 2010, but is set to gain back that stock price and more. Short of already being a household name in entertainment technology, Panasonic is partnered with Tesla in the lithium-ion battery market. Japan is Tesla's second-biggest customer after the U.S., and Japanese Panasonic has entered agreements to support Tesla's battery Gigafactory in Nevada with money and workers. Panasonic's previous work with rechargeable batteries in its tablet and mobile phones means it's familiar with the technology and prepared to advance it. Clearly, Panasonic is also not a pure-play battery company. Though it does work to produce lithium-ion batteries, it is also heavily involved in the tech sector. But this can be beneficial, since the company’s numerous technological innovations have provided it with a profitable boost. It isn’t tied down by its work in the battery sector, but innovations in that sector can only help — much like SolarCity's solar panel expansion, Panasonic will apply newer and better lithium battery technology to its future devices. Samsung, like Panasonic, has been working with lithium-ion batteries in its devices for years. Its stock in recent years has risen 57.5%, and its newest innovation has the potential to raise those gains drastically. Early in 2015, Samsung announced a new design for its lithium batteries: the cathode, opposite the anode in the battery, would be made with graphene coated onto the silicon. This increases the density of the battery, and can increase the energy capacity to between 1.5x and 1.8x current designs. Unlike Tesla's addition of silicon in the anode, the graphene cathode doesn't have battery-shattering results. The graphene is another layer on the anode rather than an added component to the silicon. However, though it adds to the energy capacity of the battery, its current design shortens the battery's lifespan. Both new battery designs will need improvements before they enter the market. On a commercial scale, Samsung has supplied the batteries used in Germany's Younicos battery park. Since 2014, this park has been storing up to 5 kilowatt hours of energy, combining conventionally-produced electricity with renewable energy and seamlessly sending both out onto the grid. Johnson Controls is another multi-industry company that focuses on both lithium battery production and vehicle accessory manufacturing. This company's stock has risen 47.65% in the past five years, driven by both sides of the company. However, in June 2015 the company announced that it was spinning off its automotive business. There were originally talks of selling off that part of the company in order to focus on the more lucrative lithium battery market. In the end, the company decided on a spin-off instead, opting to keep its place as the world's largest vehicle seating supplier. Its income from these operations rose 19% in the second quarter of 2015 from the same time the previous year, and immediate gains from selling would not have been worth the cost. With this business plan, the company can focus both on innovation and marketing, developing its lithium-ion car batteries alongside, yet separate from its accessory sales. Johnson Controls also had the first plant in the country capable of producing lithium-ion cells for vehicles, and that plant gave it a huge advantage in public lithium battery use. In 2013, the company partnered with the U.S. Department of Energy to supply batteries to hybrid trucks used by publicly-owned utilities and municipal electric companies. 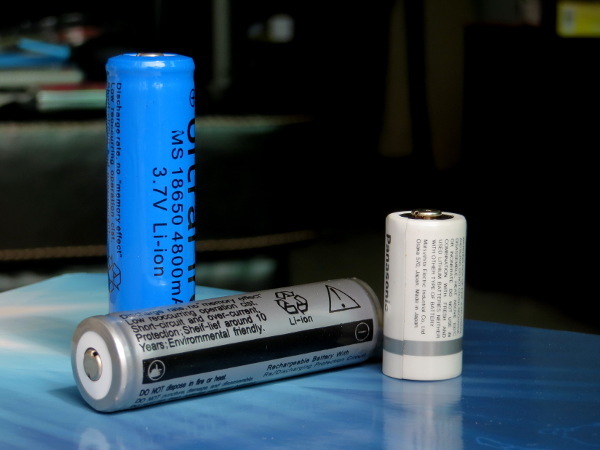 There are many other companies involved in the research and development process to create more efficient lithium-ion batteries. And the industry is still young; more improvements are on the way. These companies, though they are already making huge strides forward, are only the beginning. 2017 and beyond will show huge gains. Companies whose success doesn’t rely on battery improvements alone will come out on top. And when the full potential of the technology makes its way into their products, they’ll be the first to benefit. Energy and Capital editor Keith Kohl explains why a deal in India could mean big things for the EV market and send two of our favorite energy metals to new highs. A war of innovation is underway between Apple and Tesla in this growing market. It could be make-or-break for Elon Musk and Tesla, as well as Tim Cook and Apple. Energy and Capital editor Keith Kohl offers readers a look at the lithium market in 2017.